What does it mean to be a citizen? What impact does an active democracy have on its citizenry and why does it fail or succeed in fulfilling its promises? Most modern democracies seem unable to deliver the goods that citizens expect; many politicians seem to have given up on representing the wants and needs of those who elected them and are keener on representing themselves and their financial backers. What will it take to bring democracy back to its original promise of rule by the people? Bernd Reiter’s timely analysis reaches back to ancient Greece and the Roman Republic in search of answers. It examines the European medieval city republics, revolutionary France, and contemporary Brazil, Portugal, and Colombia. Through an innovative exploration of country cases, this study demonstrates that those who stand to lose something from true democracy tend to oppose it, making the genealogy of citizenship concurrent with that of exclusion. More often than not, exclusion leads to racialization, stigmatizing the excluded to justify their non-membership. Each case allows for different insights into the process of how citizenship is upheld and challenged. Together, the cases reveal how exclusive rights are constituted by contrasting members to non-members who in that very process become racialized others. The book provides an opportunity to understand the dynamics that weaken democracy so that they can be successfully addressed and overcome in the future. "A remarkably written book. Bernd Reiter explores with a rare accuracy historical privileges and exclusion in order to unveil and illuminate the mechanism of contemporary racialization. An essential contribution that makes comprehensible the complex mechanisms producing as well as perpetuating discrimination and unequal treatment among citizens." 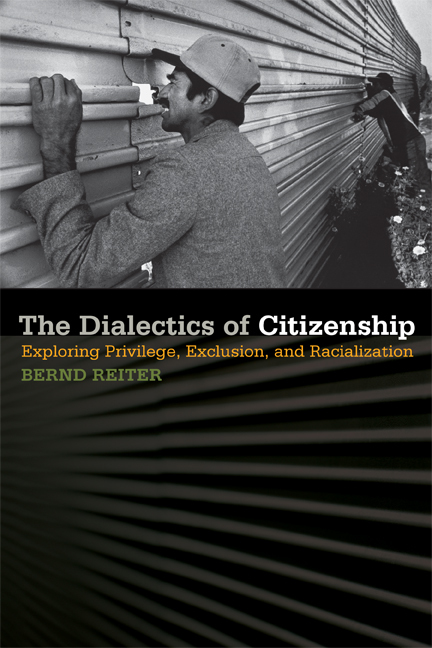 "Reiter has written an insightful and important book, capturing an underanalyzed phenomenon in modern democracy—the restructuring of citizenship as an act of participation to citizenship as a set of entitlements. He captures the consequential risks of this (re)evolution, not least the alienation of the citizen from government. This book raises concerns for all democrats across the political spectrum."